Can I be a Geek ? 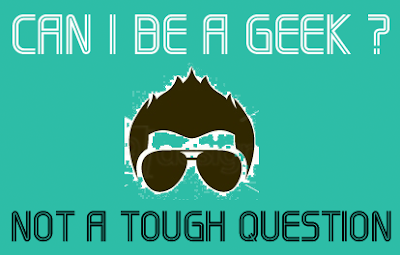 Hello, guys what's up.Today every wants that he or should know about technology and why not it has become a trend.So from now I am just starting a series on "Becoming a Geek" or you can say "how to become a geek".So guys lemme elaborate what is mean by a geek. Geek is a very impressive term.We can say a person is a geek if he or she is highly attracted towards technology and mathematics (but I not like maths as much as technology).You can see geeks everywhere in your town, in your city, in your state or your country xD.I don't know if you are a geek, but I am damn sure that you are Techie! As like me. Who can be a Geek? 5.He will be a social freak in both Online and offline both. So everyone can be a geek and for this you just have to know what is going on in the field of technology or simple words you can say that you have to be updated with Tech news and you know a little bit about developing and don't try to show off your knowledge everywhere like a NERD.And always try to be yourself and don't hesitate to express your thoughts in public but always wait for your chance as I said don't show off your knowledge. However, you won't know if you are geek sometimes !.For example, if you love tech, but you don't want to expose your talent anywhere and at that time you are just hiding your geekiness. Am I Perfect to be a geek? Look friend no comes in the earth with having 100 percent perfection.So everyone can be everything so please don't think like if you are not a geek or u can be a geek.And guys in my point of view if a person is very dedicated and active to this work he is a GEEK. Because the base meaning of geek is dedicated and hardworking so everyone can be a geek. No Comment to " Can I be a Geek ? "